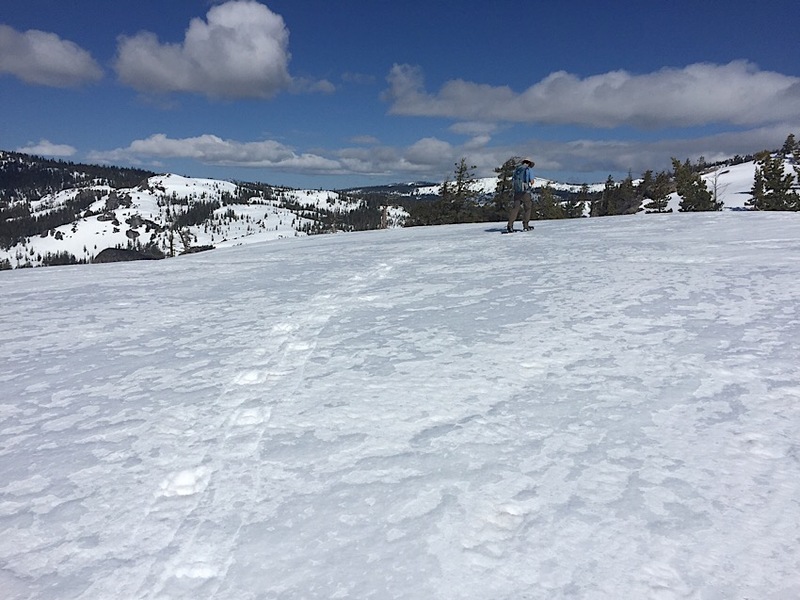 April 1st marks the average maximum snowpack date for most years in the Sierra. 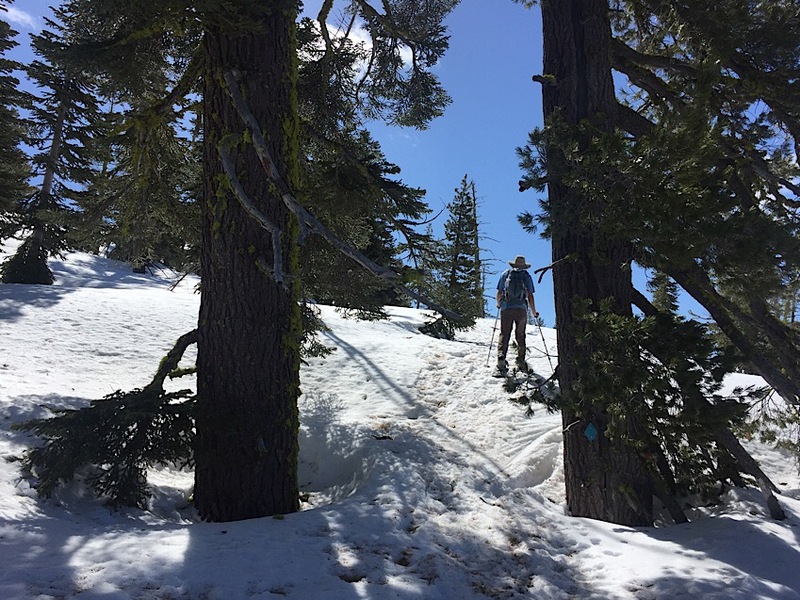 In other words, if you want to see the most possible snow on the ground in California, early April is probably a good time to head to the mountains. 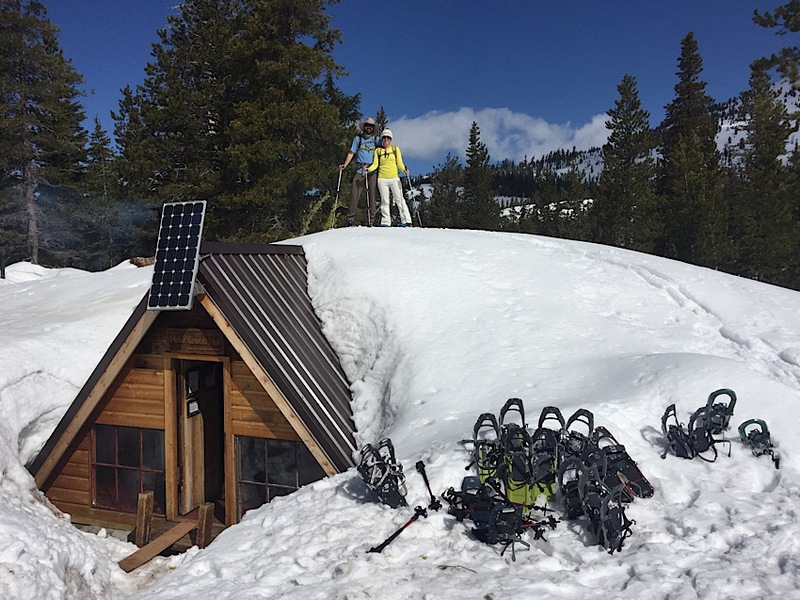 The Peter Grubb hut is one of several old Sierra Club huts around the Tahoe region. 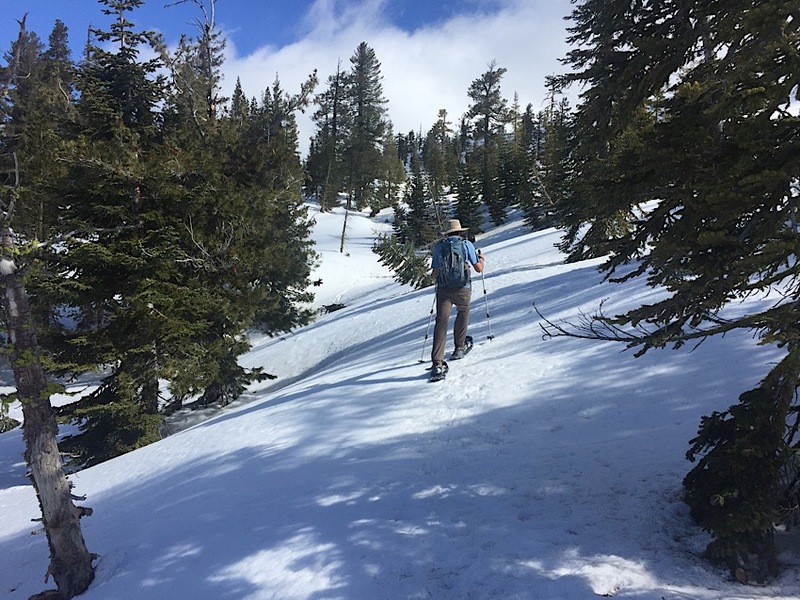 It’s a relatively easy hike and in winter, it makes for a great ski or snowshoe trek. Directions to Trailhead Exit I-80 at Boreal/Castle Peak. The trailhead is the only thing on the north side if the freeway. Parking can be found along Bunny Hill Drive on the south side of the freeway. 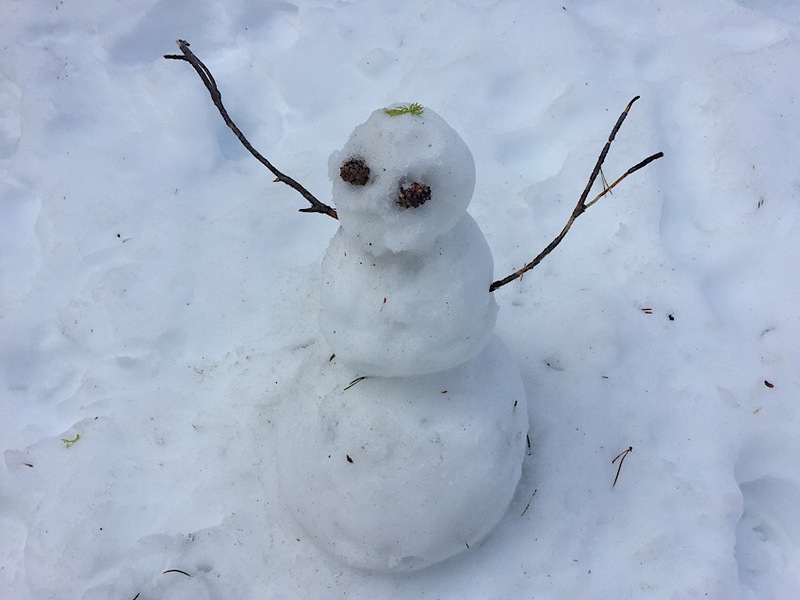 (Turn left onto Bunny Hill Drive towards the Sno-Park, Boreal Inn and Pacific Crest Trailhead). 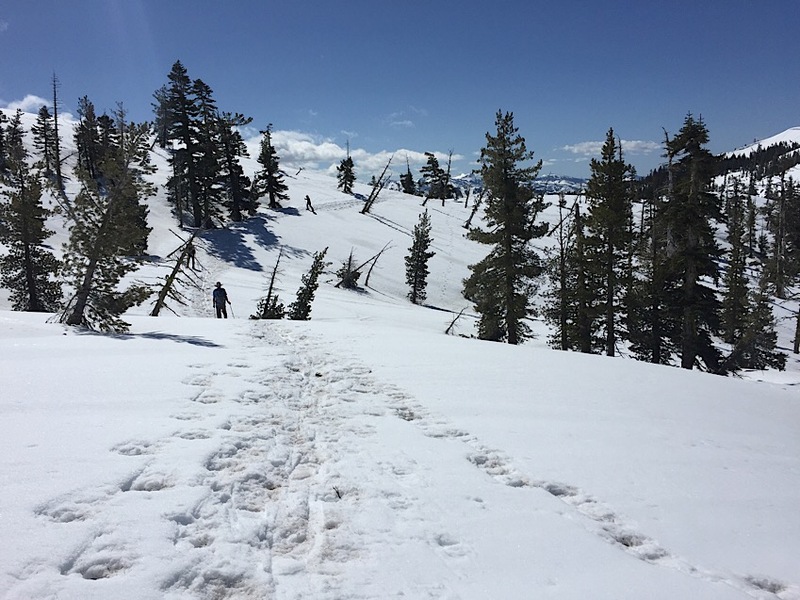 Sno-Park permits are required November 1 through May 31. Google Map link to trailhead. 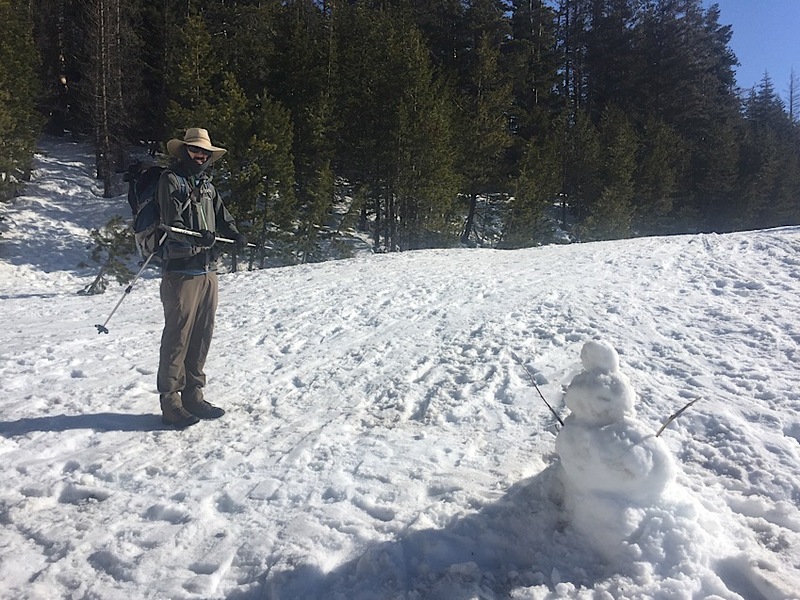 With beautiful sunny weather in the forecast, I couldn’t help but plan a trip up the snow. We weren’t feeling super ambitious, so we decided on a quick hike to the Peter Grubb Hut. We’re familiar with the area, so we didn’t need to do much planning and we didn’t need to worry about route-finding. Because we didn’t do much planning… I forgot to bring socks. (That’s what happens when the weather is warm and you leave the house wearing flip-flops.) I realized this when we were halfway to the trailhead. Fortunately, the first gas station we stopped at actually sold socks! Two dollars later, we were ready to go. We reached the trailhead sometime around 9am. The area around the Boreal Inn can get crowded, but 9am is early and we easily found parking. 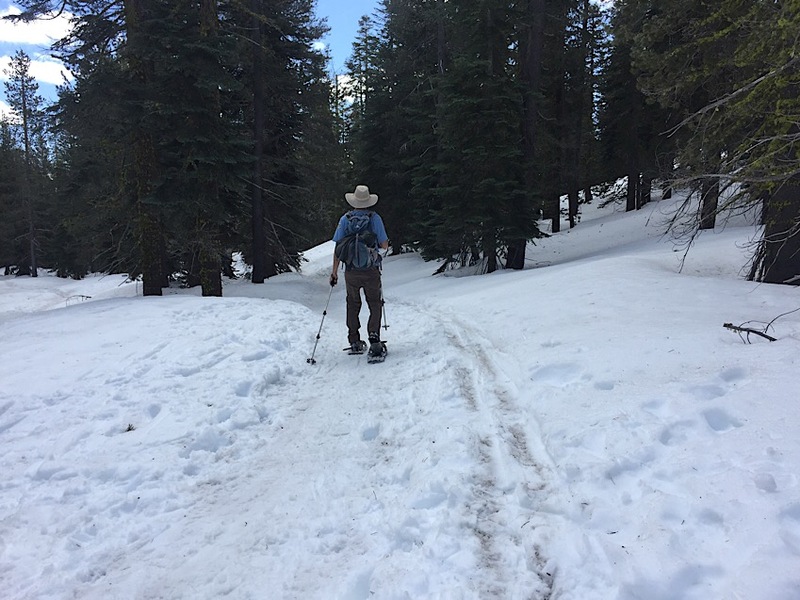 We started up the trail without putting on our snowshoes. This trail gets a lot of use and the snow was very compacted. There’s a creek down there in that hole. We hiked quickly and without any breaks up to Castle Pass. 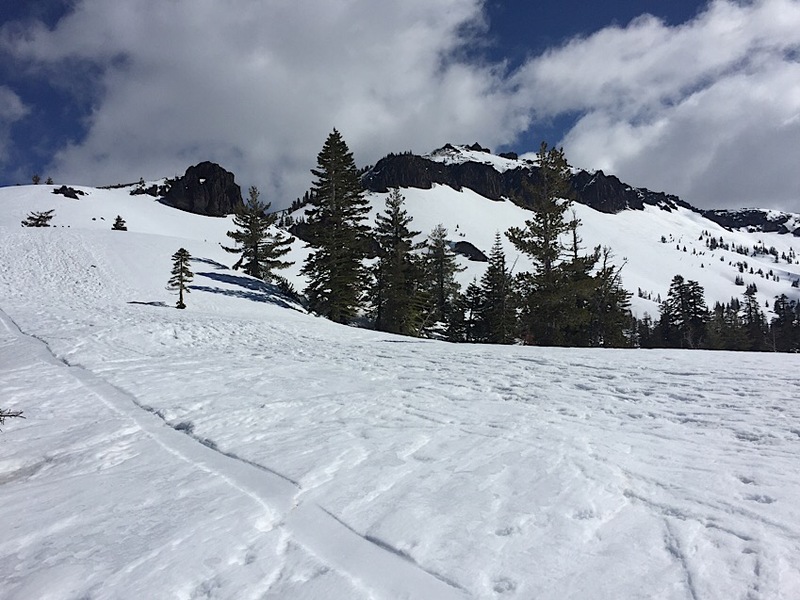 We could see Andesite Peak to our left and Castle Peak to our right. Here, the vast majority of hikers turn and continue up to Castle Peak. We headed straight and quickly began post-holing. 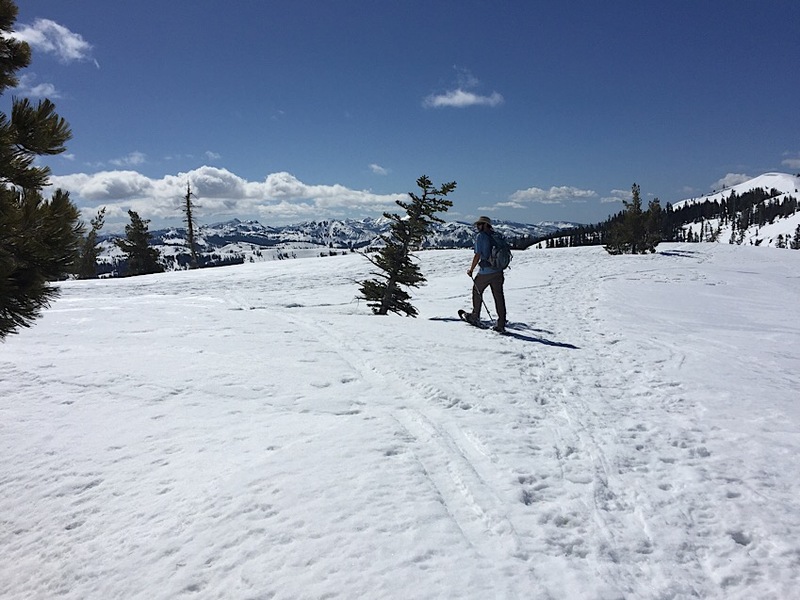 We stopped and put on our snowshoes. 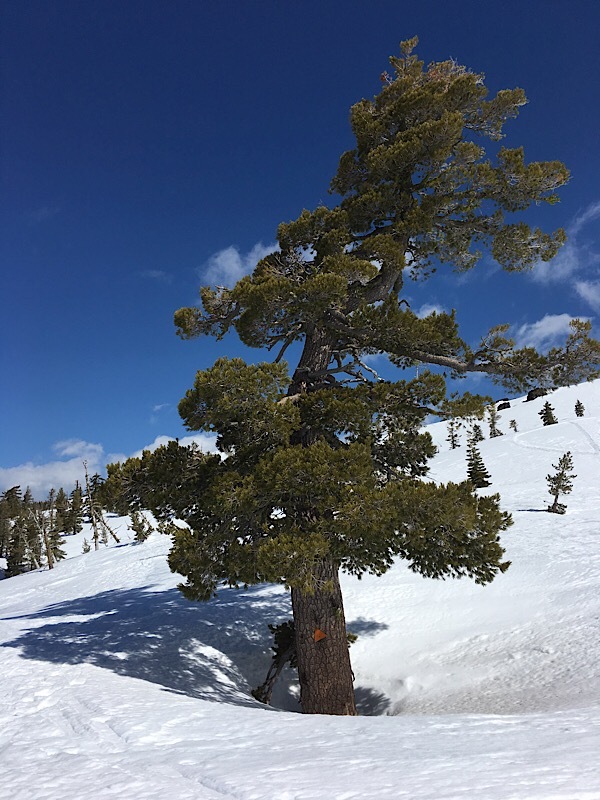 We should have followed the ridge toward Castle Peak, then turned left at this tree. 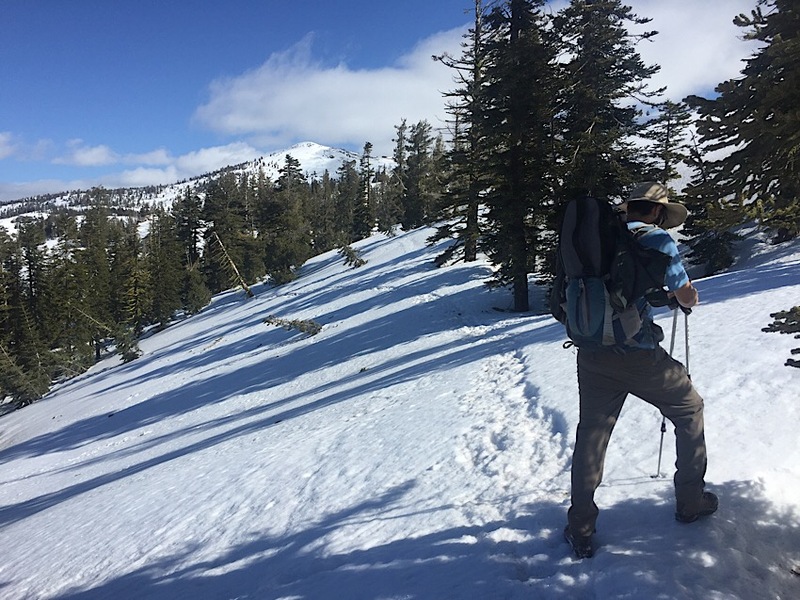 Despite completely missing the trail, we used our PCT app to navigate to the hut. 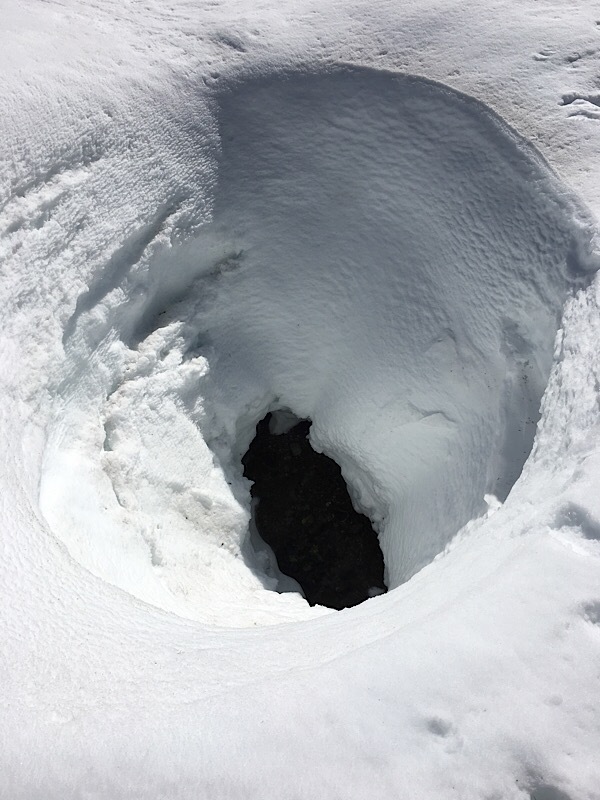 With the snow being as deep as it is, we almost didn’t see the hut, but somebody had a fire going and we could smell and see smoke coming up out of the ground. Standing on the roof of the hut. I had planned to eat lunch at the hut, but it was still early and we weren’t hungry. We snapped a few photos, then turned and hiked back toward Castle Pass. This time we followed a clear trail all the way back. When we reached the ridge above Castle Pass, we stopped for lunch. From there, it was an easy couple of miles back to the car.